Travel with Kevin and Ruth! : Stranded in Baggs, Wyoming! On the road at 9:00am yesterday morning, with a plan to make it to either Craig, Colorado, or Baggs, Wyoming. Or, somewhere in between. The first order of business was to make it through the mountain pass on Colorado highway 139 heading north. The weather was good, so no chance of problems at higher elevations. And it turned out the road was fine. 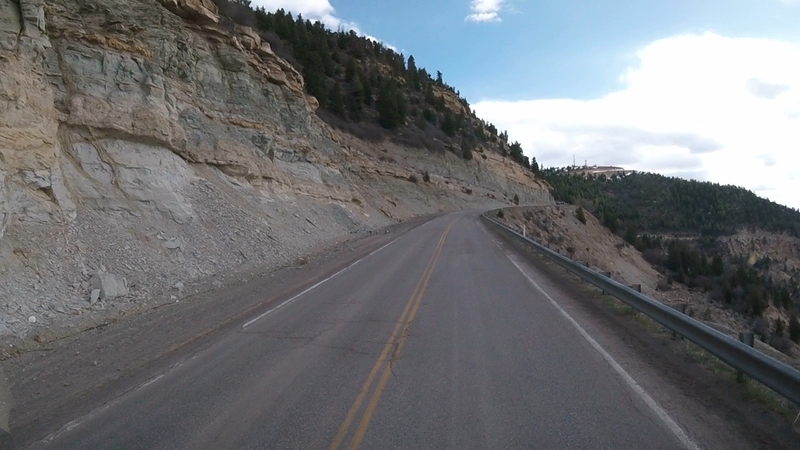 This road takes you from about 4,500 ft elevation to about 8,500 ft...and then down the other side. Heading north on Colorado 139. Starting to get up there now. There's where we came from. Hardly any traffic, which was nice. Sherman would have done fine anyhow, because the speed limit on this section is only 25 mph. We had no problem doing that speed on the way up, and that's the speed we wanted to be doing for the way down anyhow. Because we did the way down in first gear! Heading downhill. Still quite a bit of snow on the other side of the mountain. Doing the steep downhill section, I only had to touch the brakes three times, and even then only for a second or two. Doing it slowly, and in first gear is the way to go! Made it to the bottom, no problem. Then, it was towards Colorado 40 east to the town of Craig. Scenery along the way. Nice...no traffic. Colorado 40 east, heading towards Craig. Again, nice road with no traffic. Arrived in Craig (pop 9,000) about 1:30pm. Did some grocery shopping, then found a laundromat. While laundry was doing, I walked over to a nearby tire shop and spoke to the guy about some new boots for Sherman. Long story short, he would do 6 new Firestone Transforce P235/85R16 tires for $1,180 USD installed and balanced, taxes included. Not a bad deal, considering our two front tires are exactly the same model and cost $200 a piece four and a half years ago. But, he didn't have them in stock and they wouldn't arrive until 11:00am the next day. So, after the laundry was done we carried on towards Baggs, Wyoming. We arrived in the town of Baggs, Wyoming at about 4:30pm. Driving down the main drag, I spotted a police vehicle parked at the side and so I pulled over and went and talked to him about where we could park for the night and not be bothered. A woman with her dogs overhears the conversation, and says "you can park right here" and points to the spot right behind where the cop is parked. The cop says that's fine, and so that's where we parked! Looking out our side window. Sherman parked for the night in Baggs, Wyoming. So we got parked up, and even had a free unsecured wi-fi signal. So, I'm checking our route for the next driving day and a weather warning pops up. Turns out they're expecting 12-17 inches of snow in the area just north of here between Rock Springs and Casper. Yikes! So, we had some rain overnight, and woke up to a dusting of snow on the ground. But, we're looking at trucks that have come from the north, and they're covered in snow. The weather warning is supposed to end about 3:00pm this afternoon, so we'll just sit tight here in Baggs (pop 440!) for the day. Not the best place to be stranded, but well make do. Now, I wish we would have stayed in Craig and got the tires done. Oh well. Yesterday's drive 219 miles (350 kms). Kindle e-Reader is on sale today at Amazon.com...if you always wanted one, today is the day! Kindle e-Reader on sale today! Yep, that was the plan all along. I just happened to see that tire shop while Ruth was in the laundromat. The price I worked with him was before tax, and then I mentioned that we were headed for Montana and asked if he would do it for that price tax included. There is a huge markup on tires, so I figured he would. But thanks for thinking of us! I found that the RV tires on our motorhome did NOT do well on ice or snow at all. About as much grip as a baby's bottom. Stay holed up until it clears, I'd say. Snow and motorhomes don't go well together! On Colorado 40 west of Craig, how did you know Sherman would fit under that "interesting overpass"? I've heard of apps and truckers' GPS units that give height clearances. There was no sign on the overpass; was there a sign before you actually got to it? Didn't know until we got there Dinah. But Sherman is only 11'3", so we've had very few of those kinds of problems over the years. Yes...there actually is a sign at the underpass. It says 16'3", so we had lots of room. It turns out I can get the same deal in Swift Current...at $1,480 CAD. I hope the snow on your planned route lessens so that you may proceed with your journey. We are now camped in Yellowstone National Park, awaiting the start of our seasonal jobs next week. It has been gently snowing since we got here yesterday. Staying inside and staying warm. Yes it did, thank you Page!